Porsche 360+ also offers the customer inspiration in various categories, such as experiences and possible services. This includes, for example, vehicle services such as a premium hand wash at a preferred location. But the digital lifestyle assistant also provides inspiration when it comes to restaurants and travel, with hand-picked options. Exclusive advantages are also included, such as access to selected business clubs for Porsche 360+ customers – for example, they can use conference rooms at airports. Porsche 360+ can be downloaded from the App Store for iOS. Customers can find more information on 360plus.porsche.com. 911 Carrera 4S: Fuel consumption combined 9.0 l/100 km; CO2 emissions combined 206 g/km) in the S models. The drive efficiency has been increased by way of an improved injection process and a new layout for the turbochargers and charge air cooling system. The power is delivered by a newly developed eight-speed dual-clutch transmission. 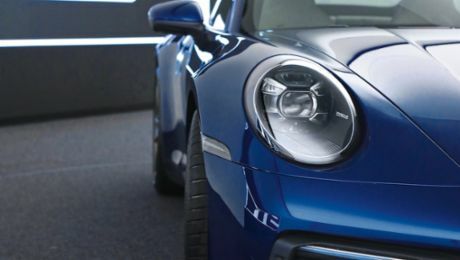 Additional highlights include the new assistance systems, including Porsche Wet mode to make driving on wet roads even safer, and Night Vision Assist with thermal imaging camera, as well as comprehensive connectivity – which now also uses swarm intelligence. The 911’s features are rounded off by three exclusive digital offerings: in addition to Porsche Road Trip, there is also the web-based Porsche Impact emissions calculator for neutralising your individual carbon footprint, and Porsche Road Trip for extraordinary journeys.